They had Aaron Donald walking back and forth talking to himself for like 2 straight minutes. Just randomly ****. Then this fool yells to Brady " you better get rid of it fast " lol. Rams announcer says not many teams have an Aaron Donald! Lol yeah, how many have Tom Brady???? ****bags!! I skipped through that. So stupid and corny. I've watched miked up and inside the NFL every night, cant get enough of a win like last Sunday. On the contrary I've never re watched a loss. does that make Donald a cornball brother? Inside the NFL (SB edition) wasn’t very good this year. Too much blabbering and clips shown from other teams throughout the season. Not enough mic’ed up bits from the big game. I don’t remember it ever sucking this badly. Mic’ed up was much, much better. Whatever happened to that show, “Turning Point?” I still have a couple of episodes on my DVR from the last two SBs, but couldn’t find it anywhere, this year. Turning point was probably the best. Micd up better videography but Turning point better analysis. My only question is which game did the quotes from Slater at the end come from (note jersey color). Maybe sarcasm, maybe serious? I can't tell with you but Sony is definitely not even close. Sony has been good but not great, a nice offensive piece. Hopefully he gains some more burst. I'm serious. His game winning TD is more valuable than anything Donald has ever done. I thought about skipping it but I stayed lol. It just went on and on.. I wish they had more Belichick clips. I like watching him interact with the players. His coaching clips, he also makes great eye contact!! Something I noticed at 19:00 - Even if Cooks catches that ball at the back of the endzone, J-Mac knocks him out and he wouldn't have two feet inbounds. I appreciate that Gilmore had nothing more on his mind other than catching the INT then finding the ground to have 0% chance of turning the ball back over. If you want to distract Belichick, hide your head coach. Put him in random spots, cover him head to toe in camoflage, have two assistants hold a bedsheet in front of him, hire lookalike body doubles, place him in the coach's box. Bill spends key points of the game watching the behavior of the opposing head coach. Hide him! In this game I might have played the equivalent of a Box and One against the Patriots. One DB plays man against Edelman, the rest play zone. 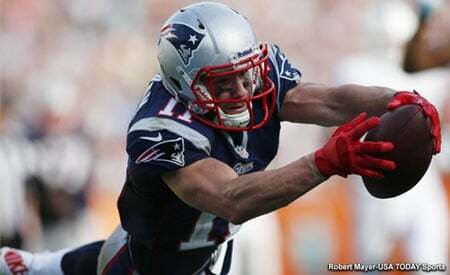 That way a defender may still be in the area if Edelman shakes loose his man. None of the other WRs seem good at finding soft spots in zones and settling in. I have a very difficult time watching any show that allows Ray Lewis to speak. That man actually believes he’s a good orator when the fact is, he comes across as a self-centered preacher with no flock. I could not agree more as this is a really good assessment of Lewis. But I will give Ray this. He's the best middle linebacker in NFL history that's killed two guys. My wife doesn’t like football but loves these mic’d up shows. She doesn’t even know anything about Ray Lewis but immediately asked me to fast forward after about 10 seconds of his “sermon.” It’s exhausting even listening to this turd. Been groovin' on all the clips posted in the forum this week... Mic'd up and Turning Point were very cool... especially the insight around the Rams seeing the opportunity on that Cooks play against quarters, and vice versa, the Patriots seeing their adjustment to drop back to the post... Almost like hearing "Malcolm, Go!!" ... !! Thanks for that Link. Really awesome stuff. OMG, that was amazing! Thank you... I'm such a crybaby. Has anyone seen or heard from @PatriotsReign? That was Goff saying it to his offense.